I think I’ve made the Groupon and Enron comparison myself. In both cases, you had high-flying companies that focused on short-term growth while ignoring the underlying risks of what they were creating. One of the challenges of negative press like this is that Groupon is dependent on cash flow from selling new deals to pay off merchants from old deals. Consumers will also stop buying deals. It could also lead payment processors like Chase Paymentech and American Express to terminate their merchant relationships, which would also lead to cash-flow issues for Groupon. If the Groupon currency market were as efficient as bond markets, this news would cause Groupon to collapse overnight like Lehman Brothers. Fortunately for Groupon, the market is not that efficient. Groupon customers outside of the United States and Canada will also be hurt because Groupon generally holds on to their money until a Groupon is redeemed. When Groupon collapses, it will cause some serious pain for Chase Paymentech and possibly American Express. I estimate that Chase has at least $500 million in chargeback liabilities if Groupon goes under. But because Groupon doesn’t accurately track which Groupons were redeemed, this liability could be much higher. Any consumer who had purchased a Groupon could claim they didn’t get what they paid for. I called on credit card companies to take a look at their exposure from Groupon months ago in a Bloomberg West appearance. The biggest losers in a Groupon collapse would be the small businesses who run Groupons. As of the end of the 4th quarter, Groupon owed small businesses $520 million. This number is likely at least $100 million higher. These are people who can hardly afford to take a hit of several thousand dollars. The other potential loser is Ernst & Young, the auditor that signed off on revision after revision of Groupon’s bogus financial statements. 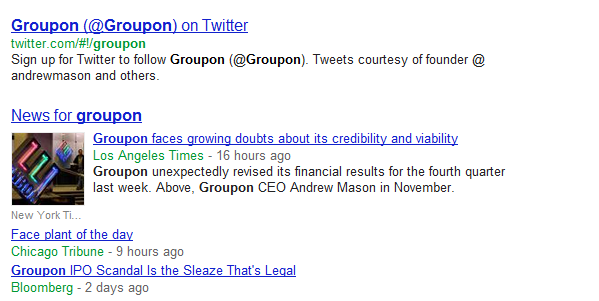 (Though I don’t expect Groupon to take down Ernst & Young like Enron took down Arthur Andersen.) I’m not ordinarily one to call for Congressional hearings, but E&Y deserves to be raked over the coals for sanctioning Groupon’s financials. Oh, and a note to the Los Angeles Times: I fully expected this. See my worst-case scenario of what happens if Groupon collapses. Also see my collection of Groupon stories following the restatement. Disclosure: I have investments and several ongoing bets related to Groupon. Maybe this is Google’s way of getting back at Groupon for rejecting their $6 billion offer last year! I am sure Mr. Mason regrets that decision but fairly sure Google is celebrating his decision.